(Charlottetown, P.E.I.) – Kronborg is coming home. After a sold-out performance at Indian River in July, Confederation Centre is pleased to announce an encore concert performance of Kronborg 1582 – coming home to the Centre for one night only. The rock opera starring P.E.I.’s Aaron Hastelow as Hamlet will be presented on September 5 at 7:30 p.m. in the Homburg Theatre. This performance also marks the kickoff to The Charlottetown Festival Theatre Conference, September 5 to 9. There will be a tickets pre-sale for members as of tomorrow, Tuesday August 8. Tickets for general public will be available as of Wednesday August 9. Tickets are also available as included in Festival Theatre Conference pass. Tickets are available at the Confederation Centre Box Office at 130 Queen Street, online, in person, or via phone at 1.800.565.0278 (toll free) or 902.566.1267. Kronborg features a Festival ensemble and orchestra of more than 30 performers from Anne of Green Gables-The MusicalTM and Glenda’s Kitchen. The Festival’s Associate Artistic Director, Mary Francis Moore directed the production and musical direction is from Craig Fair. The production rocked the rafters at the Historic St. Mary’s Church in Indian River on July 28, playing to a sold out house. The Buzz reviewed that show calling it “Spectacular…impressive… left people on their feet literally screaming for more!” With that magic in the air, producers felt Island audiences deserved a chance to see the Festival classic back where it all began — on the main stage. Based on the Shakespearean tragedy Hamlet, the rock opera was originally produced by Confederation Centre in 1975, starring Brent Carver and Beverly D’Angelo, and went on to play on Broadway. The musical was created by Cliff Jones and was originally commissioned by the CBC. It tells the story of a Danish prince who plots revenge on his uncle for killing his father. This concert performance replaces the originally scheduled concert performance of The House of Martin Guerre at this time, which is unable to be presented this season to unforeseen events. 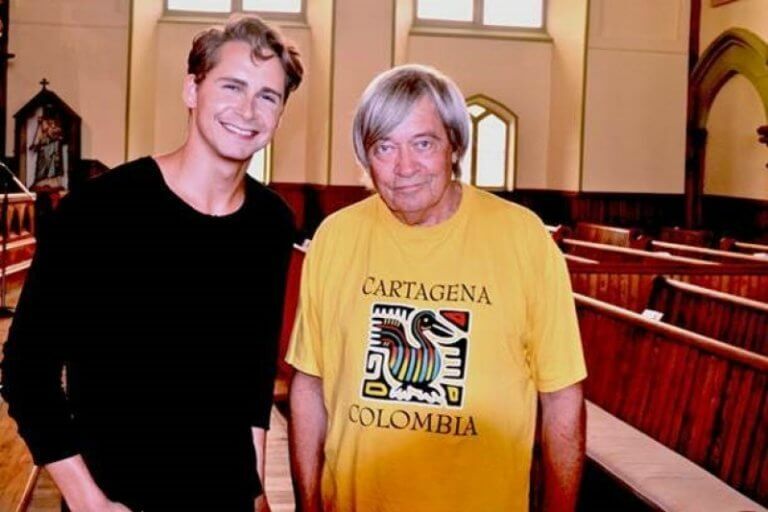 Photo cutline: P.E.I.’s Aaron Hastelow, left, poses with musical creator Cliff Jones at Indian River following the sold out July 28 performance of Kronborg 1582. The rock musical will return to Confederation Centre of the Arts on September 5 (Doug Gallant photo).